Milcreek Farm is a local supplier of natural, pasture raised beef, lamb, goat, and eggs. They also offer livestock waterers, livestock fencing, and hay. 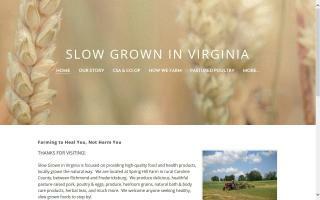 Slow Grown in Virginia is focused on providing high-quality food and health products, locally grown the natural way. We are located at Spring Hill Farm in rural Caroline County, between Richmond and Fredericksburg. We produce delicious, healthful pasture-raised poultry & eggs,heirloom wheat, oats, produce, bath & body care, and herbal teas. We welcome anyone seeking healthy, slow grown foods to stop by!